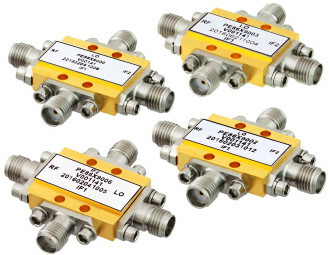 Irvine, California - Pasternack, a leading provider of RF, microwave and millimeter wave products, has released six new IQ mixer models with RF and LO frequency bands ranging from 4 GHz to 38 GHz and In-Phase and Quadrature IF bandwidths ranging from DC to 4.5 GHz. Typical applications include point-to-point and point-to-multipoint radio, VSAT, Military Radar, EW, Satellite Communications, sensors, and test and measurement equipment. Pasternack's new IQ Mixer modules are composed of MMIC based assemblies which use a highly reliable GaAs MESFET semiconductor process that consists of a pair of matched double-balanced mixer cells, a 90-degree hybrid and a 0-degree splitter/combiner. This level of integration offers advantages in size and performance when compared to discrete module assemblies. With the addition of an external 90-degree IF hybrid module, these IQ Mixers can be configured as an Image Reject Mixer or Single Sideband Upconverter Mixer. Image rejection and sideband suppression can reduce overall system cost and complexity by removing the need for preselection filtering. The IQ Mixers' performance as an Image Reject Mixer (IRM) includes low conversion loss that ranges from 7.5 to 10 dBm, high image rejection up to 35 dB typical, and LO to RF Isolation up to 42 dB typical. These designs offer excellent linearity with input 1 dB compression as high as +20 dB typical and Input IP3 as high as +35 dB typical. LO drive power ranges from +15 to +19 dBm. These models are offered in hermetically sealed Kovar™ drop-in metal packages that are gold-over-nickel-plated and support field-replaceable SMA connectors. All units are RoHS compliant, export classified as EAR99, and guaranteed to meet MIL-STD-883 environmental test conditions for fine and gross leak and temperature cycle. "Our comprehensive new line of IQ Mixers offers designers six new models that are extremely useful for applications involving Image Rejection and Single Sideband Upconversion. Products like these usually command very long lead-times, but Pasternack has all six models ready and available to ship today," said Tim Galla, Active Component Product Manager at Pasternack. Pasternack's IQ Mixers are in-stock and ready for immediate shipment with no minimum order quantity. For detailed information on these products, please visit https://www.pasternack.com/pages/RF-Microwave-and-Millimeter-Wave-Products/iq-mixers.html . For inquiries, Pasternack can be contacted at +1-949-261-1920.